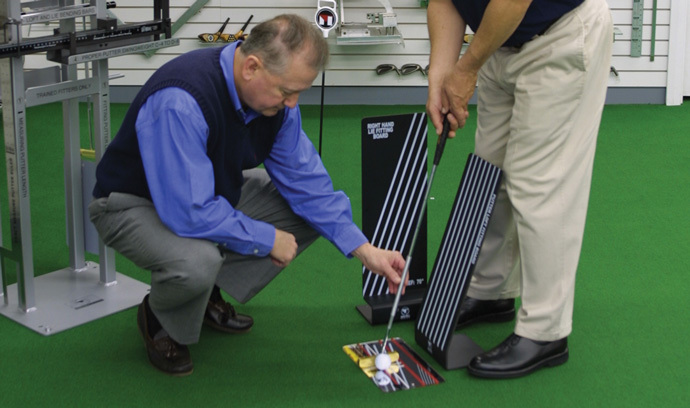 There are 5 important steps that you must fully understand to properly fit a golfer for putters. These variables have a major impact on putter distance and control. Putting is nothing more than consistent distance and directional control of the golf ball. This is easier to accomplish if you know the facts about proper putter fitting. I have a method of explanation that makes this very easy to understand and then the next easy step is for you to go out and do something about it. When discussing putter fitting it is best to break down each of the five putter fitting variables and discuss each regarding its effect on either distance control and/or directional control of the putt. Length equally affects both distance control and directional control of the putt and is very important regarding consistency in putting. The correct putter length depends on the type putting stroke you use. The most popular putting stroke today is when the golfer is slightly bent over at the waist and the knees slightly bent until the eyes are directly over the ball. The stance is square to the putt line and both arms are hanging down vertically and directly under the shoulders. The ball is approximately positioned out from the left heel. The stroke is a pendulum motion using the shoulders as a pivot point and causing the putter head to go slightly inside on the back stroke to square at impact to slightly inside on the follow through. Putter length is measured and fitted with the golfer in this position. Putters for men are mostly sold in 35” and 34” standard lengths (a few 33” exist). Womens’ putters are standard at 33”. Both men and women golfers will almost always fit into shorter lengths than those offered as standard. The average seems to be about 33” for men. The average standard length putter used on the PGA tour is 33” to 33 ½” for men. Women will usually fit into 31” to 32 ½” lengths. When fitting putters, length should always be the first fitting variable determined. Loft has greater effect on distance control than directional control but does affect both. 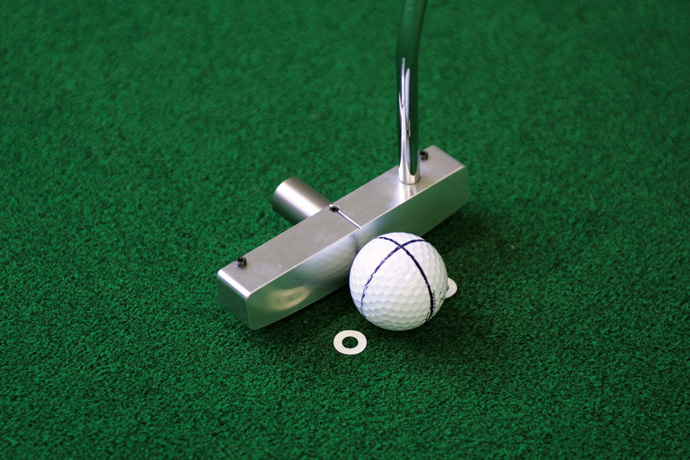 A putter needs loft to be able to putt with any consistency. The amount of loft at impact needs to be between 3º and 4 ½º. Here’s why: on a green, when the ball comes to rest it settles down slightly into the grass. When you putt you do not want to drive the ball through the grass to get it up on top but rather you want to lift it out of its depression and place it up on top of the grass. This eliminates the possibility of the ball bouncing which is bad because it makes distance control more difficult. Next, a putt has initial skid and then it eventually goes into pure roll. We want this skid and roll percentage to be as consistent as possible through all lengths of putts. Research shows that 3º to 4 1/2º loft on a flat face will be the best way to accomplish this. If the loft is reduced to say 1º, it is not enough to get the ball out of its depression and it will bounce. If the loft is say 6º, the ball will be lofted too high which will also cause it to bounce. In either case distance control is less consistent because we need the ball skidding and rolling with minimum bouncing. Lie is almost all directional control in putting and very little in distance control. Because a putter has loft, anytime the lie angle is not properly fitted to the individual golfer the ball will not go in the direction your putter head is pointing. Basically when the loft angle is tilted (lie angle not correct) and not parallel to the ground, another angle is formed which we will call the misdirection control angle. A good example to explain this would be a golfer putting with the toe sticking up in the air at address. This would mean that the golfer is holding the putter too flat for the putters build in lie angle. Another way to say this is that the putters lie angle is too upright for the golfer and needs to be adjusted flatter in lie angle to fit properly. Assume the putter in question has 4º loft and is held 3º too upright (toe up). Because the 4º loft angle is tilted it creates a small misdirection control angle which points to the left. If we hit a 28 foot putt the ball would be pulled 1 5/8” left of our intended line and would lip out and miss. If all putters had 0º loft this misdirection control angle would not even exist. However, we would now have more difficulty in achieving good distance control. Fitting the proper lie angle on a putter is very important and should not be overlooked. Swing weight is used as a means to be sure the putter head and the putters’ length have the proper weight relationship between them. This characteristic is a major factor in distance control of the putt. It also is a significant factor in directional control. The golfer needs to have enough weight in the head to achieve proper feel and balance of the putter. Too light and it is difficult to obtain a smooth backstroke, follow through and distance control. Too heavy and it is very difficult to get any kind of distance control, especially on longer putts. Heavy putters are, however, very accurate on shorter length putts. The best swing weight range is between C-8 and D-6. The problem with a number of putters currently in play is that they were built with the old lighter head weights and many fall into the A-1 to C-0 range. This is definitely a problem that most golfers do not need, so if you fall into this category check the swing weight on your putter. If necessary, simply put lead tape on the sole of the putter making sure to evenly cover the entire sole in layers until the correct weight is achieved. If you are following the current trend of “counterbalanced” putters, you need to be sure you have enough head weight to have the head feel you need to execute a smooth stroke. Most designed counterbalanced putters start with heavier head weights, usually from 370 grams to over 400 grams. For most players, these heavier head weights require some level of counterbalancing to give them the proper head feel. If you have a standard head weight putter, say 350 grams or less and you add a counterbalance weight, you may find that all head feel goes away, making it very difficult to execute a proper, smooth stroke. You may need to experiment to find the right balance for you, but research indicates that the ability to repeatedly execute a smooth controlled stroke can be improved with heavier head weights and some level of counterbalancing. This fitting variable splits itself in importance between distance control and directional control of the putt. There are many very good putter designs on the market. Today we have the newer larger head shapes that claim high moments of inertia but there are still many of the traditional putter shapes to choose from. Putter shafts can be straight, single bend or double bend. The putter heads can be center shafted or end shafted. Much of this is personal choice regarding looks, feel and above all feeling comfortable with your choice. An important performance variable to consider when buying a putter is whether or not you want the easier playability of a high MOI putter head design. High MOI putters are far more forgiving on off-center impacts. My putter testing using high speed photography also says that you want a smooth flat faced putter. That being said, most putter designs today have some form of milling, or inserts, or grooves in the face claiming that these types of surfaces will reduce backspin and skid on putts. My research has indicated that this does not occur to any significant degree. Milled faces do insure the face is flat, so there is a positive to milled faces. My advice is take the claims of improved roll from grooves or inserts with a grain of salt, and concentrate on getting a design that suits your eye and has the highest MOI possible. If you really want to get into understanding all the performance variables in putters, their playability differences, in-depth fitting of putters and actually seeing the high speed photography of the putter head and ball at impact, then you want to watch my two-hour video, Dynamic Putter Fitting. I believe that anyone reading and applying this article to their own situation will improve their putting. Too many golfers know too little about their equipment and they accept the playability of their current golf clubs not realizing how proper selection and fitting of golf clubs can help them play better.